This week the Bloggers Challenge Group was issued a color challenge....Pumpkin, Chocolate Chip, Old Olive, Brocade Blue and White OR Vanilla were to be used on your creations....Challenge it was. Normally I don't start off my projects with a colors in mind, I work with my technique and image, and pick my colors out from there. So for me this WAS a challenge. 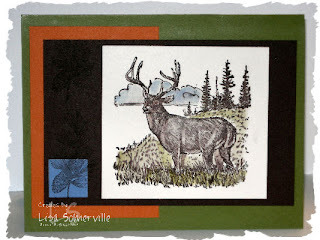 I decided to turn to my Stampin' Up! Fall/Winter Collection catalog for inspiration - and that's where you'll find these three layouts. I also wanted to let you know - Artistic Outpost is having a SALE....35% off Holiday themed stamps and 20% off all other stamp plates. Free domestic priority shipping on orders over $35.00 and FREE for international orders over $75.00. Great card Lisa! I love the layout you used. You did a great job. I don't know which one I like best.....they are all stunning! cutie Lisa... doesn't appear to be much of a challenge... your cards look beautiful. 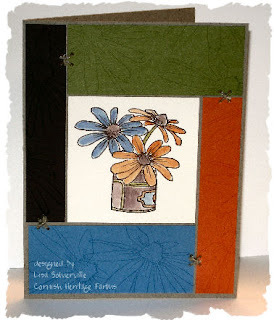 I really really love the look of your floral card!! So pretty!! For someone who thought this was a real challenge, you really got after it with 3 projects. All of them are wonderful...as always! you answered the color challenge extremely well! I especially love the card with the flowers, but they're all beautiful! Nice job! Wow girl, you were busy! 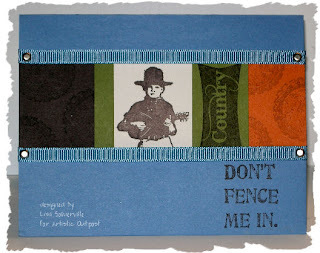 I love all the cards but love the "don't fence me in" one the most! Yeah Lisa, doesn't look like it was too much of a struggle. You did a great job on all three cards! OMW! THREE cards! you rock! I LOVE number 2!!! Really nicely done. Gosh you made 3 different & unique cards with this color combo. They are all wonderful. I think my favorite is the Cowboy one. I just like the subtle way you used all the colors on this card. Great job on all of these! It's amazing how the same color combination can have such a different "feel" depending on the images and layout used. WOW! This Challenge looks like it was a breeze for you! ALL the cards are fabulous. All three cards are wonderful and unique! They each have their own style even though they use the same colors!!! Isn't that a new picture, too? You look awesome, my dear! Love the new look of the blog, too! All 3 cards turned out great. I'm really liking that cowboy! Beautiful Lisa. I like the second one best...I've had my eye on that layout for a while now, but haven't used it. I love it with these colors!